Isis is finally here. The competitor to Google Wallet is now available for use on AT&T, T-Mobile and Verizon. If you have a phone without a hardware secure element, this is the tap to pay for you (for now, at least). To get a sim card, call your carrier store and see if they have them in stock. I phoned both of my local shops only to find neither actually have the cards in stock. The gentleman I spoke to last said they “should be in today” and to call back in about an hour. Call before you go. Your other option is to call your carrier’s customer care line and request to have one shipped to you. The cards are free through corporate locations. I have not been a huge proponent of Isis. I’d much prefer to use Google’s Wallet service, as all of my information is already with Google. 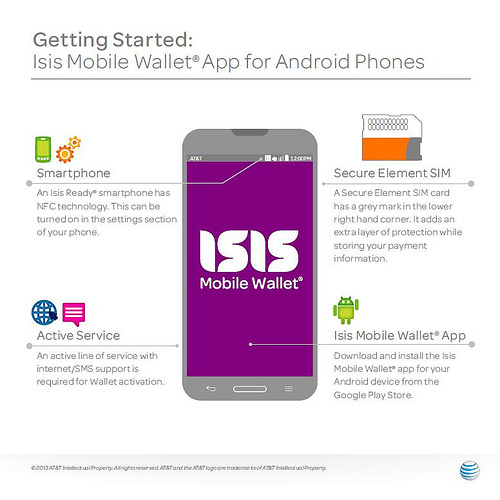 Seeing as that’s not an option (HTC One has no hardware secure element on any carrier aside from Sprint), I’m going to give Isis a try as soon as I can get a sim with a secure element. Keep on the lookout for the review in a few days. I just tried to set up the app without a sim card. Before I got too far (read: anywhere) the app informed me that it will NOT work with rooted devices. I suppose rooted users will have to wait for KitKat and hope it supports Google Wallet with an emulated secure element.